An Indonesian hero – tomato, garlic, spring onion & a hint of chilli. Loaded with rice noodles. 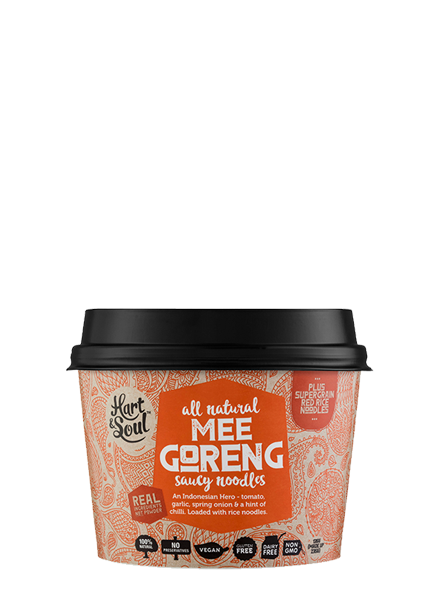 Mee Goreng Sauce [Water, Coconut Sugar, Carrot (6%), Shallot, Rice Bran Oil, Garlic, Soy Sauce (From Soy), Chilli, Tomato Paste, Spring Onion, Cornstarch, Soybean Paste (From Soy), Salt, Ginger, Sesame Oil], Rice Noodles (37%) [White Rice, Red Rice (7.5%), Tapioca Starch, Water].